Samsung is all set to launch the Galaxy S10 next month and the leaks have already started pouring in. Just a couple of days ago we got to see the Galaxy S10 Plus in a leaked image which showed off the pill-shaped cutout in towards the corner of the screen. Most fans have mixed opinions about this alternative to the notch; however, the Galaxy S10 lineup would no doubt be one of the best devices to be launched this year. To add to the leaks, the device has now been spotted on Geekbench with a single-core score of 4382 and a multi-core score of 9570 which is a significant improvement over the Galaxy S9 lineup. 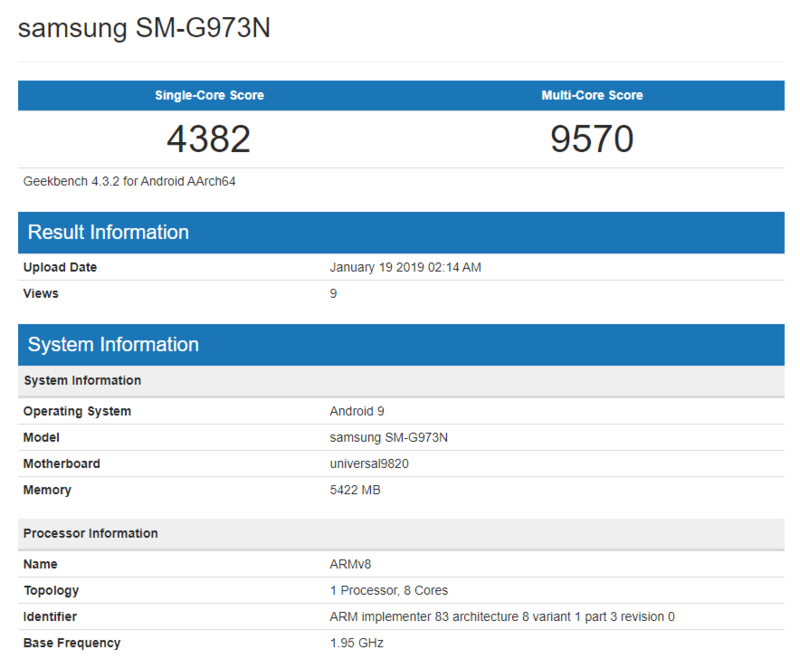 The Geekbench results also show that the device has 6GB RAM and is the SM-G973N model which means the device is the Korean variant powered by the Exynos 9820. A couple of days ago the SM-G975U was also spotted on Geekbench which a single-core score of 3413 and a multi-core score of 10256. It seems as though the Exynos variant has better single-core performance while the Snapdragon variant has better multi-core performance. Nevertheless, let’s brace ourselves of the launch of the Galaxy S10 lineup which should be unveiled on 20 February.